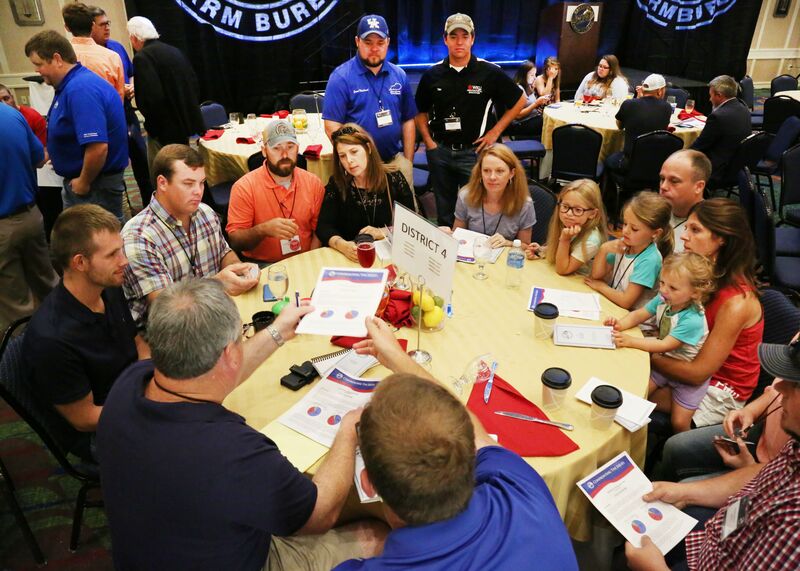 Thomas Folz of Christian County attended his very first Kentucky Farm Bureau Young Farmer Outing this year but being a young farmer is nothing new to him. He, and his family, farm about 3,000 acres in Herndon, Kentucky. By virtue of his heritage, Folz is a young farmer by birthright but for this recent Murray State University graduate, he wants to be more involved than just carrying on the family business. Attendees at the KFB Young Farmer Outing come together to hear speakers, participate in family activities, and tour local agri-businesses. Folz is the face of the new generation farmer and was joined by nearly 300 others in that same category for this year’s outing. While they all may have different farming operations, they all have a few things in common including navigating a challenging farming environment and doing it through the advocacy efforts of KFB. During the two day event, attendees heard from KFB leadership who spoke on many topics including the importance of relationships with their local and state lawmakers; the significant of the policy development process and an update to the gathering on some of the current agricultural issues going on at the state and national levels. Attendees were also able to take tours of local agri-businesses and enjoyed family activities including a trip to the University of Kentucky’s Kroger Field, as part of the two-day event. Agriculture Commissioner Ryan Quarles also spoke to these young farm families and shared with them many of the initiatives taking place at the Department of Agriculture and how important this generation of farmers is to the industry. Young farmers in Kentucky likely have better opportunities than their counterparts in other states thanks to the investments made over the last 20 years, especially from ag development funds. In addition to the fund, Quarles mentioned the opportunities afforded by the Kentucky Agricultural Finance Corporation (KAFC). One of the most important events of the Young Farmer Summer Outing came during the annual Eggs and Issues Breakfast. Members gathered by district after the meal to discuss topics specific to their areas as part of the policy development process. Wesley Estes, from Logan County participates in his county’s Young Farmer program, is a member of his local FB Board, an ag-ed student at Western Kentucky University and a former FFA State President. He said his involvement in the YF program began after his junior year in high school. “I really fell in love with the program especially after going to the YF Outing in Pikeville. At the local level, I try to help out with fund raising events and community service projects; really, it’s about whatever they want, I just try to show up and help out any way I can,” he said. Estes, who represents a fourth generation on the family farm, said the common thread whether a young farmer grows crops or raises livestock is that they all love agriculture. The discussion meets Estes spoke of are a KFB tradition at the Summer Outing and participants take part in a panel dialogue-type atmosphere talking about different ag-related issues. Each participant is scored by a panel of judges. The top four will participate at the state competition held during the KFB annual meeting. This year’s finalists included Miranda Chaplin of Bourbon County, Taylor Jones of Gallatin County, Lilly Robertson of Logan County, and Cody Rakes of Marion County. The other big announcement made each year during the outing is the naming of the three farm families that will participate in the KFB Young Farm Family of the Year competition. The winner will also be announced during annual meeting. This year, those three finalists are Nicholas and Bethany Hardesty of Meade County, Matt and Amanda Gajdzik of Shelby County, and Ben and Katie Furnish of Harrison County. KFB Young Farmer Advisory Committee Chair Zack Ison of Mercer County summarized the outing saying how important it is for these young farmers to get together in this type of setting. “It’s an opportunity to network and sit down together to discuss policy issues and develop different topics to present to KFB,” he said.